Inc. magazine is publishing a 12-part series of excerpts from The Startup Owner’s Manual, the new step-by-step “how to” guide for startups. The excerpts, which appeared first at Inc.com, highlight the Customer Development process, best practices, tips and instructions contained in our book. Feedback from my readers suggested you’d appreciate seeing the series posted here, as well. First and deadliest of all is a founder’s unwavering belief that he or she understands who the customers will be, what they need, and how to sell it to them. Any dispassionate observer would recognize that on Day One, a start-up has no customers, and unless the founder is a true domain expert, he or she can only guess about the customer, problem, and business model. On Day One, a start-up is a faith-based initiative built on guesses. To succeed, founders need to turn these guesses into facts as soon as possible by getting out of the building, asking customers if the hypotheses are correct, and quickly changing those that are wrong. The second flawed assumption is implicitly driven by the first. Founders, presuming they know their customers, assume they know all the features customers need. These founders specify, design, and build a fully featured product using classic product development methods without ever leaving their building. Yet without direct and continuous customer contact, it’s unknown whether the features will hold any appeal to customers. Traditionally, engineering, sales, and marketing have all focused on the immovable launch date. Marketing tries to pick an “event” (trade show, conference, blog, etc.) where they can “launch” the product. Executives look at that date and the calendar, working backward to ignite fireworks on the day the product is launched. Neither management nor investors tolerate “wrong turns” that result in delays. The product launch and first customer ship dates are merely the dates when a product development team thinks the product’s first release is “finished.” It doesn’t mean the company understands its customers or how to market or sell to them, yet in almost every start-up, ready or not, departmental clocks are set irrevocably to “first customer ship.” Even worse, a start-up’s investors are managing their financial expectations by this date as well. Established companies execute business models where customers, problems, and necessary product features are all knowns; start-ups, on the other hand, need to operate in a “search” mode as they test and prove every one of their initial hypotheses. They learn from the results of each test, refine the hypothesis, and test again—all in search of a repeatable, scalable, and profitable business model. In practice, start-ups begin with a set of initial guesses, most of which will end up being wrong. Therefore, focusing on execution and delivering a product or service based on those initial, untested hypotheses is a going-out-of-business strategy. Traditional business plans and product development models have one great advantage: They provide boards and founders an unambiguous path with clearly defined milestones the board presumes will be achieved. Financial progress is tracked using metrics like income statement, balance sheet, and cash flow. The problem is, none of these metrics are very useful because they don’t track progress against your start-up’s only goal: to find a repeatable and scalable business model. Most startups simply borrow job titles from established companies. But remember, these are jobs in an organization that’s executing a known business model. The term “Sales” at an existing company refers to a team that repeatedly sells a known product to a well-understood group of customers with standard presentations, prices, terms, and conditions. Start-ups by definition have few, if any, of these. In fact, they’re out searching for them! The demands of customer discovery require people who are comfortable with change, chaos, and learning from failure and are at ease working in risky, unstable situations without a roadmap. Hiring VPs and execs with the right titles but the wrong skills leads to further trouble as high-powered sales and marketing people arrive on the payroll to execute the “plan.” Executives and board members accustomed to measurable signs of progress will focus on these execution activities because this is what they know how to do (and what they believe they were hired to do). Of course, in established companies with known customers and markets, this focus makes sense. And even in some start-ups in “existing markets,” where customers and markets are known, it might work. But in a majority of startups, measuring progress against a product launch or revenue plan is simply false progress, since it transpires in a vacuum absent real customer feedback and rife with assumptions that might be wrong. The business plan, its revenue forecast, and the product introduction model assume that every step a start-up takes proceeds flawlessly and smoothly to the next. The model leaves little room for error, learning, iteration, or customer feedback. Even the most experienced executives are pressured to hire and staff per the plan regardless of progress. This leads to the next startup disaster: premature scaling. Here’s the real problem: No business plan survives first contact with customers. The assumptions in a business plan are simply a series of untested hypotheses. When real results come in, the smart startups pivot or change their business model based on the results. It’s not a crisis, it’s part of the road to success. #10 could be “Not knowing your market type”. Failing to understand differences in market types can lead to an unfortunate series of company-killing mistakes. EG: in a new market, focusing on “features” when customers are not yet aware that they have a problem that you can fix can preclude a lot of new-market activities from happening: learning how to reach and educate customers, setting up the team to learn vs execute, hiring based on title vs what the company needs.. basically #1-9 above! This reminds me of a cartoon I read early on in my career. Perhaps the author understood customer development and agile development a long time ago. A message I got is that a startup should belief that the earth in moving underneath him and should believe that what he knows are guesses. I believe many of these ideas are valid for product management in established companies especially when there is disruptive innovation happening. For example. Mobile apps are is disruptive innovation for product managers managing traditional web applications. Question: Who still hires a VP of Sales pre-launch? Very few seed-funded contemporary web & mobile startups have a VP of Sales! I know mine didn’t. It seems like you’re referring to an older model where you raised a Series A and thus cold afford a VP of Sales pre-launch. I know few companies of which this is true. Any thoughts? How would you update this for the more typical startup comprised of several hackers and perhaps a single non-technical hustler type? Thanks for the help and stay awesome. That’s why the Startup Owners Manual is written with two separate tracks: one for web/mobile without a VP of Sales and one for physical channels where they do hire VP’s of Sales. 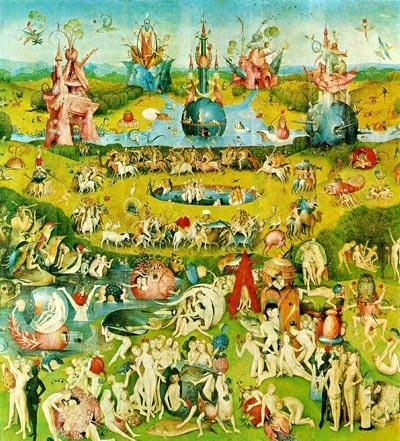 I just saw your short interview in The Atlantic regarding the end of Silicon Valley. There’s two more articles which will follow that one; they are being released over the next three weeks on the same webzine. If you have some time, read it thru and let me know if there’s anything about it that makes you want to have a chat. Wrong! If Steve Jobs followed this, we would not have the iPhone or anything Apple as a matter of fact! The Steve Jobs example is a common misconception. Apple PR has done real damage to the understanding of how entrepreneurship works. Take a look at Part 3 of this GigaOm post. I hope it explains the difference between a New Market and an Existing one, as well as why you still want do customer development. In your presentation at the Silicon Valley Bank, you stated that your goal is to transform from start up to company. 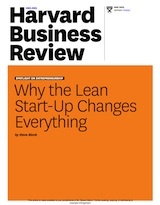 Why is it that Apple is still acting as a Lean start up ? What reasons people may have to join Apple, if this company is truly operating like a start up. I mean, after all, there is a limit to how many nights you are going to spend in office to find the right solution (I am talking about employees). Also – Do you post about events you will attending in future ? I am not a Stanford student but love to attend your presentation in near future. And then tell me that he did not consider the customer(when he says: You have to start with the customer’s experience and then go backward to the technology…). This was a man that started as a salesman in direct contact with the customer, that was mentored by the best, from Polaroid’s founder to Roberts Noice and THEN and only then, he could break the rules and have a sense of what people need. As Bruce Lee said, the master could break the rules, but he knows the rules he is breaking and why and how he can break it. The thing is, Apple is not a startup and hasn’t been since the 80’s. They had that problem in the 90’s and a startup mentality was needed, but a lot that Jobs did when he returned to Apple was based on things he learned at NeXT, which was a startup. Also, the approach was different then. The lean approach has a lot to do with the nature of the economy these days, and Jobs had a lot to do with that. Start small, say, with an app. Limit functionality to the least needed to jump. The iPhone and the new technology has actually led in some part to these methods. Again, Apple is not a startup. It’s one of the largest companies in the world and can take risks most of us cannot. They can also use their own internal resources to do customer discovery and product development. Thanks Steve. I’ve been struggling with an idea that’s been a work in progress and am going to ask my customers how to solve it. So simple. So beautiful. Thanks Steve. Will try to avoid some of those sins! Need advice. I have been following Customer Development methodology, but having hard time convincing my team members. What to do when the idea is too general and the team believe that they have already found their niche, and don’t want to test the hypothesis any further? They think the idea works and we only need to execute it to succeed. Let me explain it without disclosing the idea that we are working on or what company we are..
Ok let’s say it’s year 2000s and web design industry is picking up. Everybody (i.e companies) are going for custom built corporate websites. Let’s say we came up with idea to build a platform that builds websites in 30 minutes or less. So, we ask around, and found that almost everybody we ask wants to have websites, and tool that helps them to build in 30 minutes would be great. That’s it. We say, we are on the gold mine, let’s just execute and all companies will come to us. What would your advise be? How should I convince them that we need to test further and we need to find our niche. In start-up mode? 9 things that could kill your great business idea. Scaling a startup is part intuition, part data, part luck and timing. Hi Steve, I get what you’re trying to communicate with “#3 Focusing on the launch date.” However, technology based startups could really benefit by focusing on launch “events” instead. A launch event is a publicly facing event. It could be a customer facing dog and pony show, a webinar, a beta release, whatever. The goal of having such events is to focus company-wide energy and attention on having the next product version “ready” by that date. It’s show time. For example, I’ve been on the business side of software projects my entire career. I co-founded and sold CJ.com. I’ve been a consultant to ESPN, Cisco, and too many start-ups to count. What I’ve seen in all of these endeavors (all of them using agile/scrum/xp) is that if there isn’t a publicly facing event on the immediate horizon, then things tend to slide. The development team finds excuses to expand the scope, the business team finds excuses to add more features, velocity slows down, basically something always happens to delay or prolong the current sprint because there’s no tantamount deadline – no real visibility to the pain of not “showing up” in public. But with a publicly facing launch event, everything and everyone gets really focused on delivering to that event. Scrum meetings are tighter, marketing is aligned, the sprint targets are cleaner, and new feature requests are truly scrutinized. And because it’s public, the pain of potential embarrassment galvanizes everyone to really get it done. Here’s another example. I have a friend who used to work in TV production. There the deadlines were very clear. Each show is a publicly facing “event.” If you didn’t get the work done, it would look very bad on national TV. Guess what? The entire environment works at a very fast and focused pace. My friend then changed careers and started a new venture working with software engineers. At first it drove him crazy because there just wasn’t the same level of intensity, commitment to hit deadlines, and do-or-die attitude that he was accustomed to in TV. His solution was to implement a publicly announced launch event on a regular basis and once he did, the productivity of the entire team increased dramatically. Of course I’m not recommending that all of your other brilliant principles are thrown out the window in pursuit of using publicly facing events, only that the pressure of meeting external deadlines is essential to bring those principles into practice. The example you use, “The development team finds excuses to expand the scope, the business team finds excuses to add more features,…” is a perfect example of why most startups no longer do Waterfall development. What we replaced launch events with is Customer & Agile Development. Here a company talks to hundreds (at times thousands) of customers while releasing a minimal viable product iteratively and incrementally. 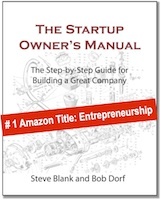 The Startup Owners Manual covers the why and how. It sounds to me as if start-ups believe they can already command the market before they’ve even established and founded their business organization. They seem compelled to fit their building of a new enterprise around what they believe the market looks like, as opposed to taking the temperature of the market and coming back with some facts and statistics about the market. However, not many people know which facts to collect and what those facts mean to them and their start-up. Crazy but true. Oh well, there is nothing like learning from trial and error, sometimes those are the hardest won and most rewarding lessons of all. Sometimes. Then there are those other times. For those other times, read Steve Blank’s “9 Deadliest Start-up Sins”. Very interesting. I’d love to hear some of your suggested solutions for these problems. 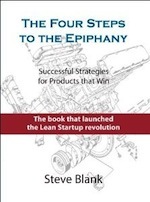 Just noticed, there is a link in a page sidebar “The Four Steps to the Epiphany now available in Russian.” that leads to _http://prostobook.com/product/11-871196, but that page doesn’t exist. You may want to fix the URL. I’ve met so many people who seriously need to read this and take it on board since finishing uni in 2008. I will absolutely take on board these points when starting my small business, and yea, I have already made a few mistakes! Thanks for sharing. I started a software business 15 years ago when the standard practice was to pretty much commit every sin listed above. That method was called “Waterfall”. Since those days many have moved to what is now called “Agile”, which is a remedy for Warterfall. I still see a lot of my new-to-business clients following the same old pattern and committing every startup sin there is. When trying to explain their strategy flaws they do not see the relationship between software that is largely intended to run their business and the need to follow a generally modern approach to business.